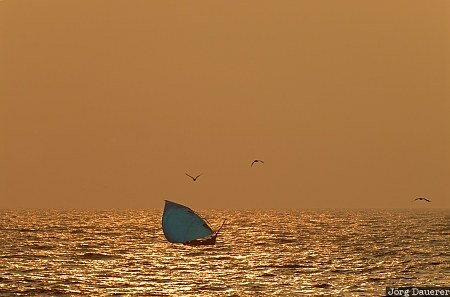 A lone fishing boat with a blue sail surrounded by seagulls on the Arabian Sea at sunset near Fort Kochi. Fort Kochi is in the western part of Kerala in southern India. This photo was taken in the evening of a humid day in February of 2011. This photo was taken with a digital camera.